As for the task of disk backup for Windows, a powerful and excellent tool-AOMEI Backupper can complete it easily and safely. It also supports backing up disk to different storage devices. MBR/GPT disk backup: Under a certain rule, the disk can be classified into MBR and GPT disk. The biggest difference between the two is that MBR disk only supports disk less than 2TB, while GPT disk supports disks larger than 2TB. External disk backup: With the popularity of computer, some external hard disk has also attracted so much attention of the users. Many people store their important or accidental information in their external hard disk. For example, many game enthusiasts would store all their games on an external hard drive so as not to occupy the storage space on the hard disk. In this case, the external hard disk should be backed up completely before hand. Therefore, it is of great necessity to have an external disk backup regularly. Backup of hardware RAID: RAID is short for "redundant array of independent disks". It is a storage technology that includes multiple hard disk drive components. Each logical hard drive of the RAID should be backed up due to its vast amount of data and files. As for the use of disk backup, the biggest one should be data protection. No matter the numerous data on any type of storage device is lost due to any reason, it can be recovered from the backed up image file easily and safely. What's more, there are several other usages as below. First, when purchasing a new computer, it is necessary to make a disk backup to an image file after the installation of the operating system and applications. If the operating system or other data partitions has any problem, the image file can be used to restore data to the previous normal state. Disk backup can assist in files restoration. For many Windows users, they may have met the serious disk problem of system crash due to many reasons, such as, virus and hacker attack, hardware failure, wrong operation, software failure, natural disaster, etc. If the files in disk are lost, we can restore the lost files from the backup file. AOMEI Backupper has all of the functions mentioned above. All the relevant problems, such as, MBR/GPT disk backup, external hard disk backup, hardware RAID backup can be resolved easily and freely. In addition, with its clear and detailed prompts, the operations of disk backup can be completed at ease. AOMEI Backupper is an excellent freeware that can help to realize disk backup easily and securely. It supports the three common backup methods as well, and you can get the detailed information by reading the article "Incremental and differential backups". Apart from the disk backup, it also supports partition/volume backup. What's more, it can complete a one-key operation backup of the system drive. Tips: download this free software , install and launch it. Step 1: Under the "Backup" tab, select the "Disk Backup" option. 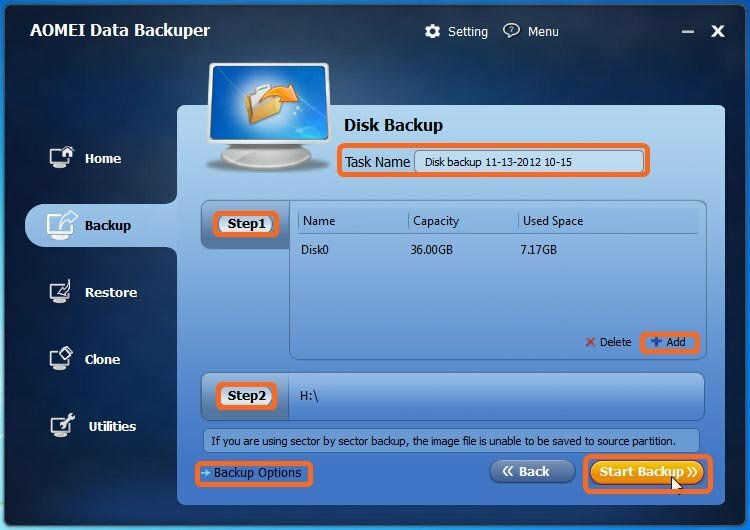 Step 2: The "Task Name" can be set so that it can help to distinguish backups from each other. 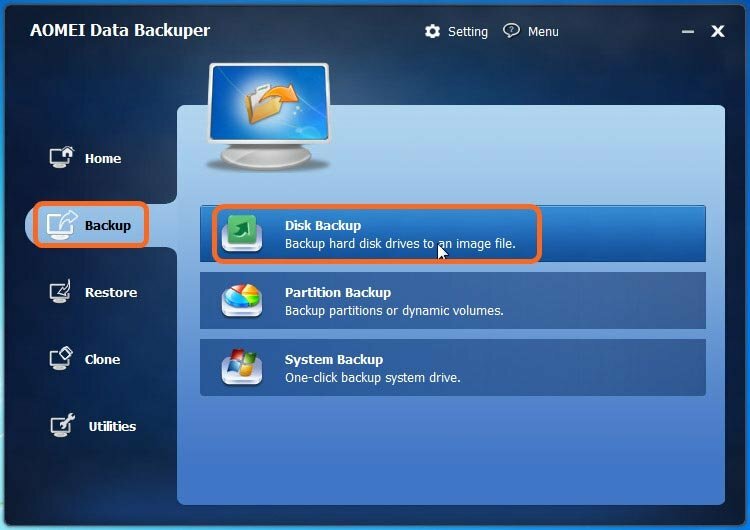 Select a source disk that you want to back up, and you can back up several disks at a time by clicking "Add". Then, select a destination path to store the image file. The above "Backup Options" can be set as well, and it is optional. It includes comments, compression, splitting, etc. 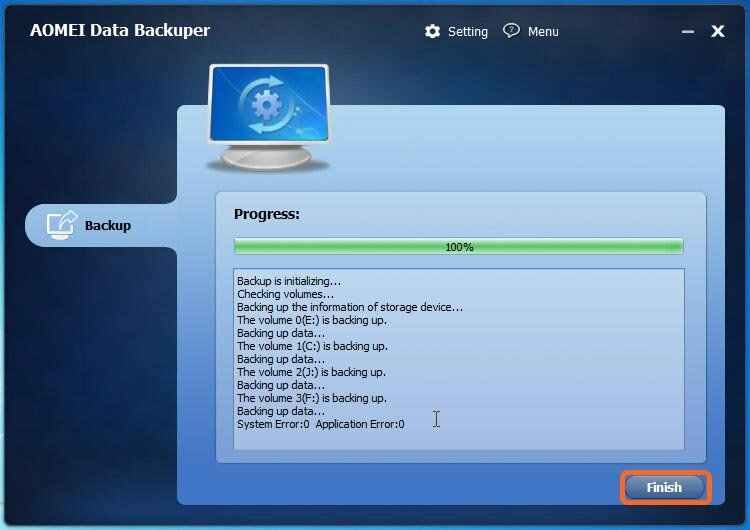 Step 3: Click "Start Backup" to carry out and wait until the operation is complete. Click "Finish" to exit the interface. In conclusion, disk backup is of great importance for all the users. Because there will be inevitable disk problem or data loss at any time, if you have not backed up the disk before hand, you would be regretful when there are something bad happen. As a powerful and free backup software, AOMEI Backupper can help you to figure out all these problems excellently.